Hi, everybody – it’s Andy Gesner and the staff from HIPVideo Promo. We’re excited to be working with Geffen Records to bring you the newest video from Papa Roach, and the first from their third album. While so many other bands of the loud rock class of ’98 have faltered, Papa Roach has persevered and grown stronger. They’ve done so by concentrating on crafting hooky, immediate choruses: anthems with real rafter-shaking muscle behind the bluster. They’ve also never sacrificed their rough edge for the sake of the marketplace, and audiences have loved them for it: their sincerity and passion apparent, this is one major-label group that has always been able to make a personal connection with their fans. Pounding, sleek, and relentless, “Getting Away With Murder” is just the latest in a series of standout cuts from Papa Roach. It shares some of the some of the unalloyed outrage of “She Loves Me Not”, and plenty of the catchiness of “Last Resort”. But while those two songs found frontman Jacoby Shaddix finding catharsis in a wild emotional discharge that teetered on the brink of abandon, “Murder” is a little different. Here, Shaddix takes a more rational approach to his own disturbed thoughts: “I need to calculate what creates my own madness”, he barks. Diabolical, venomous, surprisingly poised, “Getting Away With Murder” is as diagnostic and reflective as this music gets. If the song is an examination of an inner state, the clip adds resonance by turning the camera outward. As in the memorable video for “Last Resort”, Papa Roach is shown performing in a pit, surrounded on all sides by gyrating fans. But this is no sound-stage, and these are no ordinary teenage revelers: the people dancing to the music are grown up and dolled up, and the makeshift stage is the trading floor of a busy stock exchange. Paper floats down from the ceiling as the band thrashes away at their instruments – the group provides the restless, desperate energy that fuels the dealing, and pushes the figures along the Big Board. While corporate fat cats survey the scene from above – and attempt to nab what they can from the company safe – the whirlwind of activity below morphs into the recklessness of rock performance. The “Last Resort” video made explicit reference to Daniel Clowes’s work on the aesthetics of teenagers’ rooms, and the “Getting Away With Murder” clip is comparably cinematic – much here looks like Wall Street gone awry. Brokers (or are they just partygoers?) undress other brokers in plain sight of their overseers, goateed traders drop their phones and pump their fists to the music. It’s either subversion of capitalism at its most danceable, or the ultimate Downtown bachelor party. Perhaps both. We’re very excited indeed to be on board with our good friends Lisa Frank & Christian Taylor at Geffen Records to promote this hardworking, hard rocking band. These road warriors have a very high profile Fall Tour planned, and they will be available for interviews and video IDs for any programmer who’d like to come out and get in on the Papa Roach action. If you need more info, call Andy Gesner at (732) 613-1779, or email info@HIPVideoPromo.com . 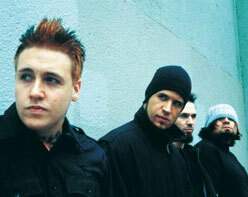 You can also visit the band’s official site to find out more about Papa Roach.